I’m not an art historian, as this post that still leaves me dissatisfied will show. But I do like art and architecture and sometimes even have coherent thoughts about them. This coherence is typified in my posts about Gothic art and architecture here and here. Part of what makes Gothic architecture easier to write about is the fact that it comes with a guidebook, almost. When Abbot Suger redesigned St. Denis, he wrote all about it. This clarity is not the case for much early Christian art. And today, I had to lead a tutorial seminar on the Catacombs of Rome, which lack much clarity and coherence because they were first excavated during the Reformation and were thus marshalled for the ‘Counter-‘ or ‘Catholic’ Reformation as Anti-Protestant/Iconoclast propaganda. Today, the Vatican still controls access to these subterranean lands full of wonderful images, thus making it harder to re-evaluate them based upon new techniques and better knowledge of the early history and art of Christianity from other sources (such as Dura Europos). The propaganda value of the Catacombs comes from attempts to proclaim all of the art Christian and all of it pre-Constantinian. This often comes coupled with the belief that the Christians lived and hid in the Catacombs during times of persecution. The idea is that if you can prove a major role for bishops and the Bishop of Rome before Constantine, as well as the centrality of martyr (ie. saints’) cults in Ante-Nicene Christianity, as well as the prominence of Christian figural art including images of Christ before Nicaea, you can prove to Iconoclast Protestants who want to separate from Rome and abolish the cult of the saints that they are treading a fine line with overturning early stages of the very tradition that gave us the Scriptures. However, I do not believe that you need to espouse this 16th-century propaganda to be Roman Catholic — not that I’m a Roman Catholic. The newer interpretations of the Catacombs are that they are subterranean necropoleis like those of other Mediterranean cities and that they housed the corpses Christians, Jews, and pagans. This view explains why there are so many pagan motifs in the art down there (you’d think it would be welcome to the Roman authorities). 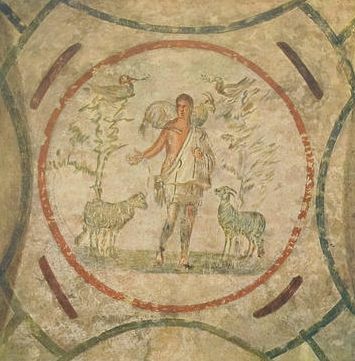 Although such a view leads to re-dating some art as well as proclaiming other art pagan, the art that seems to date from the mid-third century still has many of the major Catacomb motifs — banquet scenes, Bible stories, Christ the Good Shepherd on the ceiling, fish, chi-rhos, and the like. Thus, arguments for Ante-Nicene figural images can still stand against Iconoclastic opponents. Of course, when the material is re-dates, there is some trouble with the fact that none of the crosses or crucifixions pre-dates the fifth century. But this merely makes the Catacombs like every other place with Christian art. Christians were very slow to go about publically painting and carving crosses. My hunch is that in a culture where people are actually crucified, it’s still too raw; Christians have to spend enough time working through the shame as it is, as evidenced in Justin’s Dialogue with Trypho. I think the lack of crosses also points to the purpose of the art. While it’s likely that some Christian martyrs were buried there, no evidence exists for regular Church services down there, apart (one imagines) from martyrs’ festivals. The Bible stories tend to be images of people being saved, not of Christ’s salvific act. They are reminders of the hope all Christians hold. Another idea countered by younger scholars is that every banquet scene in the Catacombs is Eucharist. Since some of them are pagan, this need not be so. They could be images of the heavenly banquet; they could be images of the banquets Romans (Christians included) held at the tombs of loved ones on the anniversary of their death; they could be images the Christian love-feast. Who knows? Alas, however, these views are hard to find, as an art historian/archaeologist friend was explaining today over coffee. Since access to these sites is so closely controlled, and the official line so loudly proclaimed, it is hard to find a book that will break the silence and tell the truth in all its messiness and with all its uncertainties. But I like the image of the Catacombs as common cemeteries where Christians told their stories in frescoes, even if they are not always the stories we expect. It adds another angle to the evidence provided by the also scant but much more numerous documentary evidence that I usually deal with.